We learn a lot from fishing. And this learning is different with different anglers. No two anglers have exactly similar experience on the water. This is the reason why anglers like to share their experiences and love to hear others’. Each of such experiences is helpful for anglers on their next fishing trip. Here are a few of such useful tips and tricks shared by anglers. You can add plenty of realistic baitfish patterns with indelible markers to your soft plastic baits. Bring in creativity. The colors will “bleed” over time into the bait, offering them an exclusive appearance extremely attractive to fish. Swapping out the trebles on most swimming plugs for single hooks will change or even destroy your fish-catching action. If you want your plugs swimming right but get the benefits of easy unhooking of single hooks, just clip off the points on two of the times, right behind the barb. You can cut most freshwater hooks with pliers, while for the sturdier saltwater hooks, you can use a bolt cutter. You can prevent or at least reduce the dreaded wind knot by flipping over the bail manually on your spinning reel following a cast. This stops the line from twisting while it works its way to the line roller from the bail, which it does when the bail is automatically snapped shut by turning the reel handle. One of the good fishing tips is to dress diamond jigs that are classic lure for Cod, Bluefish and Striped Bass, with a colored tube, a bare hook or a feathered Siwash hook. The sooner you can switch out these various dressed hooks to find the style and color that the fish are responding to, the sooner you will be into fish. This can be achieved easily by replacing the split ring at the bottom of your diamond jig with a strong lure clip and keep swapping out hook styles. Short-biting fish such as perch, scup and sunfish grab the dangling end of your bait with their small mouths and tear it from the hook. 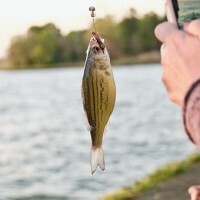 To prevent them from stealing your bait, take an Aberdeen hook having a long shank and a small gap, and thread the bait like a sock on the hook, so that a very little part will hang off the end. This works with squid strips and sea worms in saltwater and night crawlers in freshwater. Follow these tips and you will find that your fishing score has improved. Happy fishing!